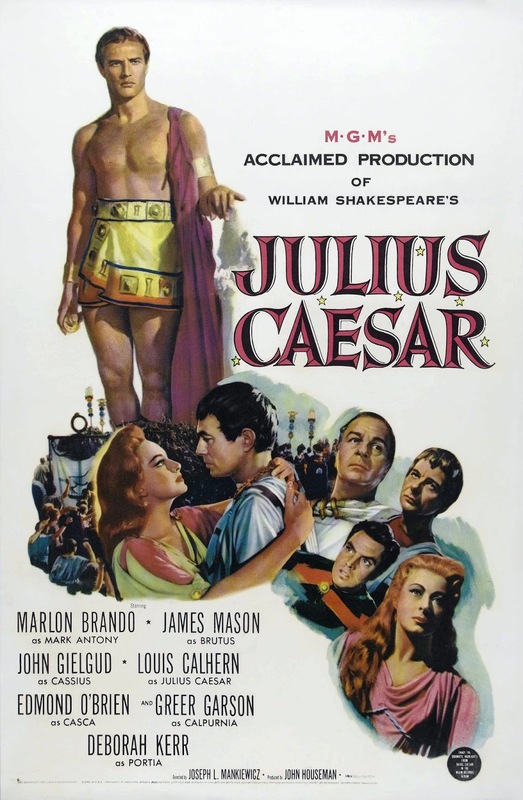 Julius Caesar (1953), starring Marlon Brando, is one of the 1001 classic movies you should see. Each Monday, I'm going to recommend a classic movie you should see (for the reasons behind the 1001 series and reviews of earlier films covered go here). Throughout April, I'll commemorate the 400th anniversary of English playwright William Shakespeare's death (he died on April 23, 1616) with a look at some of the best old Hollywood films inspired by the bard's work. First up is MGM's 1953 adaptation of Julius Caesar, which is one of the best old Hollywood adaptations of Shakespeare's plays. Julius Caesar tells the story of the ancient Roman warrior (Louis Calhern) who became a powerful force in Roman politics. Caesar is beloved by the people for his many victories on the battlefield, but a group of concerned citizens led by the noble Brutus (James Mason) and the firebrand Cassius (John Gielgud) decide that Caesar has grown too powerful, and that he must be eliminated. The conspirators believe their only option is to kill Caesar, so they make plans to assassinate him outside the Roman Senate on the Ides of March. Plans for adapting Julius Caesar had been kicking around Hollywood for decades with first MGM and then independent producers Edward Small and David O. Selznick acquiring the rights to the story without ever making a film. MGM finally gave the green light to producer John Houseman and director Joseph L. Mankiewicz in 1953 because of the fifties vogue for splashy spectacles based on ancient epics. Even so, Shakespeare was a dicey proposition onscreen, so studio executives hedged their bets by making the film as cheaply as they could. They imported sets from the Biblical epic Quo Vadis (1951), and made the film in cost-effective black and white. The resulting movie was a critical and box-office triumph that was nominated for five Academy Awards, including best actor for Marlon Brando (Cedric Gibbons did win the Oscar for his clever art direction). The best Shakespearean movies of that time period are the three British films made by Laurence Olivier (Henry V, Hamlet, Richard III), but Julius Caesar is still an excellent screen adaptation of the Bard's work. The play itself works well on the big screen because it's relatively short, the plot is action-packed, and the story, which is based on historical events, is fairly familiar to modern audiences. DP Joseph Ruttenberg's moody cinematography heightens the tension, and, in many ways, Julius Caesar plays out like an ancient film noir, especially when the band of conspirators make their plans in the midst of a violent thunderstorm. 1. Brando. Today, Brando is a Colossus in American film, but, in 1953, he was a relative newcomer who irritated Hollywood's old guard with his mumbling method acting style. His casting in the crucial role of Mark Antony was extremely controversial at the time, but Brando worked hard to prove himself. Gielgud, who was one of the great classical actors of the 20th century, coached Brando extensively throughout the production, and the result is a great performance that earned Brando a best actor Oscar nomination. 2. "Friends, Romans, Countryman" speech. The high point of the movie is Brando's speech to the assembled crowd at Caesar's funeral. The actor's brooding style serves this scene well, and Brando's fiery delivery of one of Shakespeare's best-known soliloquys is a lesson in movie-star charisma. 3. Greer Garson and Deborah Kerr. 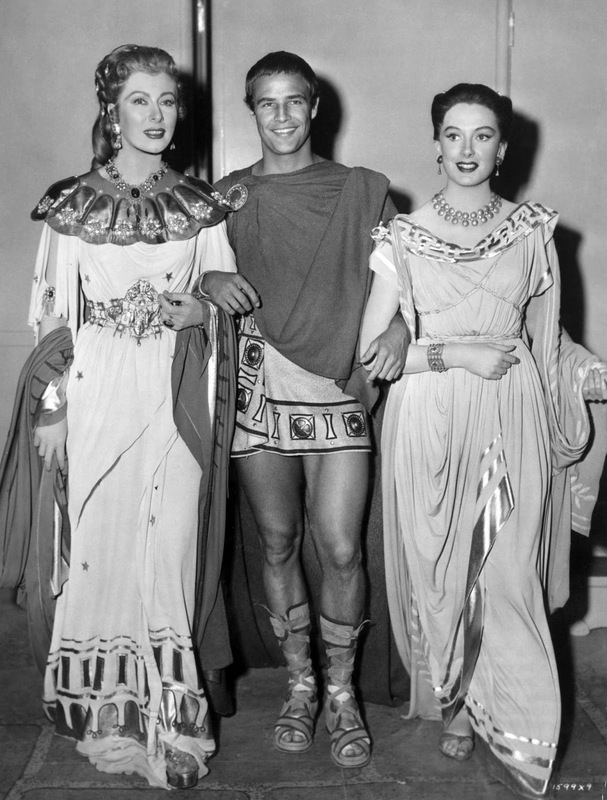 Both ladies give wonderful performances in Julius Caesar, but their joint appearance in the film represents a changing of the guard at MGM. Garson, who had been MGM's No. 1 English rose throughout the 1940's, would only make one more film for the studio, while Kerr was well on her way to becoming one of the top stars of the 1950's in films like From Here to Eternity (1953) and The King and I (1956). 4. Battle scene. If the climactic battle scene at the end of the movie reminds you more of John Wayne than Julius Caesar, there's a reason for that. The scene was filmed on location at Bronson Caverns, Calif, which was the setting for many Westerns, including The Searchers (1956). Other critics: Julius Caesar is one of the few films with an 100 percent rating at Rotten Tomatoes, and Leonard Maltin calls it a "superior adaptation" in a three and one-half star review for his Classic Movie Guide. Critics in 1953 heaped praises on the movie and Brando's performance. Bosley Crowther of The New York Times who had previously been a Brando skeptic, raved about his performance. "Happily, Mr. Brando's diction, which has been guttural and slurred in previous films, is clear and precise in this instance. In him a major talent has emerged." The British publication News Chronicle reluctantly praised the movie, stating that "It is maddening to be forced to admit it-but it has been left to Hollywood to make the finest film version of Shakespeare yet to be seen on our screens." Greer Garson, Marlon Brando, and Deborah Kerr on the set of Julius Caesar (1953). 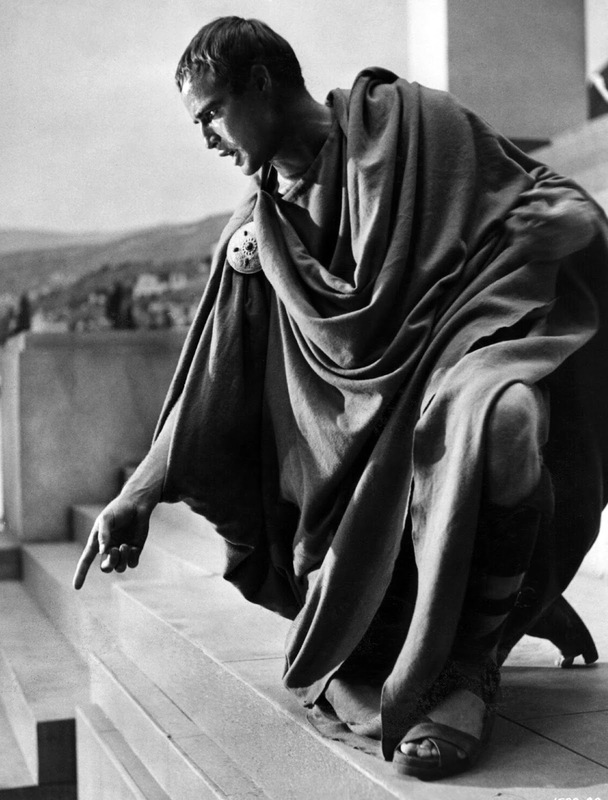 The bottom line: In my opinion, Julius Caesar isn't quite as good as Olivier's Shakespearean adaptations, but it's still a wonderful film that is well-worth watching for Brando's revelatory performance. Availability: Julius Caesar will air at 4 p.m. June 25 on TCM. It is also available on DVD, Blu-ray, and video on demand. Next week, I'll continue with the Shakespeare theme by looking at composer Cole Porter's musical adaptation of The Taming of the Shrew, Kiss Me Kate (1953). Note: this article will be published on Tuesday (April 12) because I will be participating in the Classic Movie Blog Association's spring blogathon on Monday (April 11).